For a Thailand golf vacation Pattaya is still the least expensive golf destination. While Pattaya is not a place to bring your mother, or girlfriend for that matter, and swimming in the sea is not recommended, there are quite a few good golf courses in the area; some very reasonably priced, but hardly known. Here are my three favorite of the lesser know Pattaya golf courses. 1. Emerald Golf Club since re-opening in 2006 has done a great job to improve course and playing conditions. 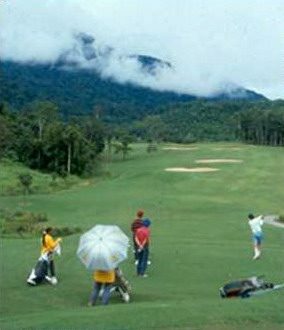 Originally named Ban Chang and then Rayong Century Golf Club the course is set into the mountains just outside Rayong and near to Eastern Star. The former Century Golf Club is laid out in a jungle setting and has some of the most beautifully designed holes on the Eastern Seaboard of Thailand. The course is carved through a virgin forest of full-grown trees that make for excellent playing under mature conditions. Unlike most Thailand golf courses there are only a few water hazards, but undulated and narrow fairways and well placed bunkers, as well as some difficult Par 3’s, combine to make the Emerald Golf Club a challenge for all golfers. 2. Wangjuntr Golf Club, a strange sounding and spelled name, features two “twin golf course” layouts each featuring 18 fairways and 36 greens, the same arrangement as the Rose Garden Golf Club in Bangkok. Added to this trick, Wangjuntr Golf Park has two of the most challenging golf courses in Thailand. The uniqueness of Wangjuntr is not only the two course designs, but also the original landscape of mature rubber trees and pineapple, sugarcane and cassava plantations that have been reconfigured and converted into two golf courses and a golf resort. The Valley Course plays over 7100 yards including 5 par 5’s and 5 par 3’s, the longest of which plays an amazing 245 yards! The interesting par 3 17th hole, is located on a cliff, and hits down to a well guarded green while offering panoramic views of the region. The par 4’s range from a short 299 to a whopping 503 yards! The 2nd hole, has a eucalyptus tree forest surrounding the fairway. The 4th hole, has a crater-like grass bunker in the middle of a double green. Probably the best hole on the golf course is the 11th, a par 5 measuring 694 yards, and is one of the longest par 5’s in Thailand. Only the two par 6’s found down the road at St. Andrews 2000 play longer. The Highland Course measures over 7600 yards making it the longest golf course in Thailand; save for the new Alpine Chiang Mai layout. If you can believe it, the Highland Course is even more challenging than the Valley Course. Every hole is a challenge in its own right and this course has to be seen (played once) to be believed! 3. While technically not in the Pattaya area, this last course deserves special mention and is worth the 2 hour drive. The Soi Dao Highland Golf Club is a demanding course near the Cambodian border and embraced by the majestic Soi Dao mountain range. Who said there were no mountains in Thailand? Designed by Dennis Griffiths, the same designer at Thai Country Club in Bangkok, Soi Dao is perfectly integrated in the surrounding jungle covered mountains. The third hole, a 192 yards par 3 is as good as they come. Spectacular mountains in the background frame the hole, so don’t get too carried away with the scenery because the tee shot requires a carry of 170 yards over a the large lake and three bunkers fronting the green. Soi Dao is my secret recommendation in Pattaya, and one of Thailand’s top 5 golf courses. Words can not do it justice, and it is worth the drive, guaranteed!